Photo by the Rainforest Action Network. As I wrote in my last post — and have been writing for years — coal is on the decline in the U.S. The biggest driver of this trend is the current low cost of natural gas from fracking, but it also has to do with increasing competition from renewables, the aging of the U.S. coal fleet, organized grassroots opposition, new EPA regulations, and slowing demand for electricity [PDF]. Arch is expected to see its profit fall by 44%, to $33 million. Alpha—still struggling to digest Massey Energy Inc. after spending $7.1 billion to acquire the competitor last year—is seen swinging to a first-quarter loss of $18 million, down from a year-ago profit of $49 million. Arch, Alpha and the rest of the industry hope that increased coal demand from fast-growing China and India will help turn the tide. But that poses additional problems. U.S. companies are scrambling to increase their access to ports in the Gulf Coast and East Coast to ship coal abroad. Arch’s and Alpha’s export outlooks, as well as sales forecasts for the higher-priced types of coal used in steelmaking, will be key to how investors view the industry’s prospects in the year ahead. 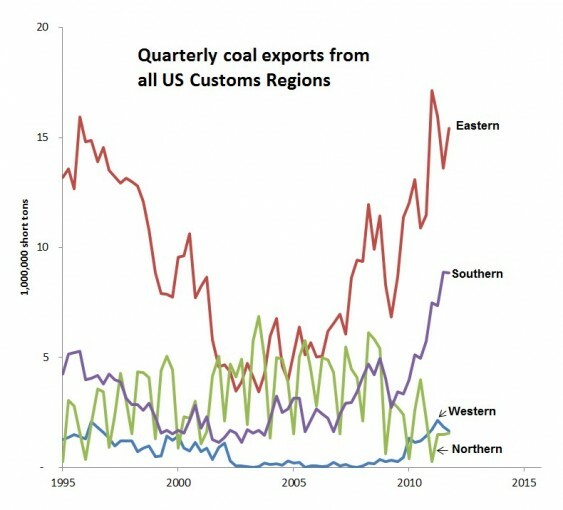 Moral of the story: The health of the U.S. coal industry hinges on its ability to increase exports to China and India. The question for the U.S. coal industry is: Can exports rise fast enough to offset declining domestic demand? The question for climate hawks is: What happens if exports can’t rise fast enough? More to the point, what happens if climate activists are able to block, slow, or at least raise the political and economic costs of coal exports? The happy answer would be that U.S. coal companies wither and a good bit of U.S. coal stays in the ground. Chart created by Sightline using data from EIA's Quarterly Coal Report. However, as the WSJ’s phrase “scrambling to increase their access” would indicate, those ports are crowded. What’s more, demand has been shifting from the E.U. to China and India, while supply is exploding in the Powder River Basin of Wyoming and Montana. Both of those trends create huge incentives for Western exports. Sure enough, there are six new coal ports (PDF) proposed for the West Coast: Coos Bay, the Port of Morrow (near Boardman), and Port Westward in Oregon; Longview, Bellingham, and Grays Harbor in Washington. If they are all built, the Pacific Northwest will export over 150 million short tons of coal a year, making it one of the world’s largest coal export regions. Suffice to say, coal ports don’t do much for local economies, in the port towns themselves or on the routes to and from them. Rail traffic would radically increase, crowding out other rail-using commodities, cutting towns in half for hours every day, and leaving a coating of toxic coal dust everywhere. Coal ports employ very few people, but are loud and polluted with diesel fumes and coal dust, which renders waterfronts unsuitable for other commercial or community uses. The increase in export capacity would also prompt new rail lines and more Powder River Basin coal mines, with all the attendant environmental ills. Ironically, all this would happen while the Pacific Northwest’s own energy system is moving steadily away from coal. So: coal companies would get the profits, Asia would get the coal, and the Northwest would get the pollution and disruption. For more in-depth takes on the impacts of coal ports, see: Coal Export: A History of Failure for Western Ports from Sightline and Exporting Powder River Basin Coal: Risks and Costs, from the Western Organization of Resource Councils. Anyway, activists are fighting all the ports in one way or another, many for these local reasons. There are some promising signs from officialdom as well: Oregon’s Democratic governor, John Kitzhaber, recently called on the feds to do a sweeping review of proposed ports. Sen. Ron Wyden (D-Ore.) has called for a “time out” on coal port plans. The EPA has called for a full review of one of the first Oregon ports. Rep. Ed Markey (D-Mass.) has called for a review of the feds’ coal leasing program (which determines Powder River Basin production). They are trying to at least slow down what is an insanely rushed process. Proponents of the coal export terminals consistently claim that the decision to authorize them will have no effect on the total amount of coal that is burned globally, and hence on the global climate. In their view, opening up the West Coast to the export of Powder River Basin coal will only change the source of the coal burned in Asia — not the total amount. This white paper explains why these arguments are incorrect, and inconsistent with both the basic principles of economics as well as the abundant literature regarding energy use and consumption patterns in Asia. This is a case where local activist fights against fossil-fuel projects matter not just for the politics of climate change, but for climate change itself. They matter for China — how much it pays for coal, how much it burns, and how fast it develops alternatives. And they matter for the U.S. The American coal industry is on the ropes. Preventing export terminals can keep it there. The activist instinct to harry coal at every stage — mining, transport, export, power plant — is the right instinct. Coal is the enemy of the human race. It needs to be kept in the damn ground.